Spring has arrived, and that means gala season is sprouting across the country-from Los Angeles to New York, and everyplace in between. Once the perfect dress has been selected, glamour girls will need an ideal hairstyle to polish off the look. That's where expert Stylist Brittany Brudzinski at Chicago's Maxine Salon (712 N. Rush St.) comes into play. 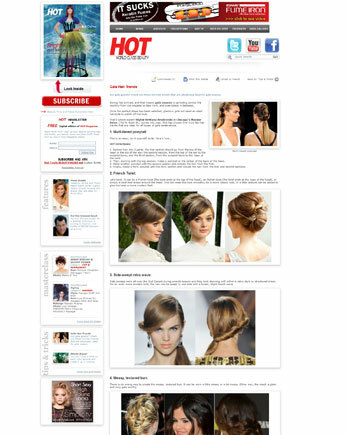 She has chosen five truly fab hair trends that are ideal for all types of gala celebrations. Section hair into 3 parts; the first section should go from the top of the head to the top of the ear; the second section, from the top of the ear to the occipital bone; and the third section, from the occipital bone to the nape of the neck. Then, starting with the top section, make a ponytail at the center of the back of the head. Make another ponytail with the second section and include the hair from the first. Finally, make a third ponytail with the third section and include the hair from the first and second sections. Let's twist. It can be a French twist (the twist ends at the top of the head), an Italian twist (the twist ends at the nape of the head), or simply a twist that wraps around the head. One can wear this look smoothly for a more classic look, or a little texture can be added to give the twist a more modern feel. Side sweeps were all over the Red Carpet during awards season and they look stunning with either a retro-style or structured dress. For an even more modern look, the hair can be swept to one side with a looser, slight beach wave. There is no wrong way to create the messy, textured bun. It can be worn a little messy or a lot messy. Either way, the result is glam and truly gala worthy. Knots and loops are beautiful, classic looks. For this season the trend is to wear the knot with a middle part.